Are you a Star Wars fan? Well, if you don’t have one of these, you aren’t. 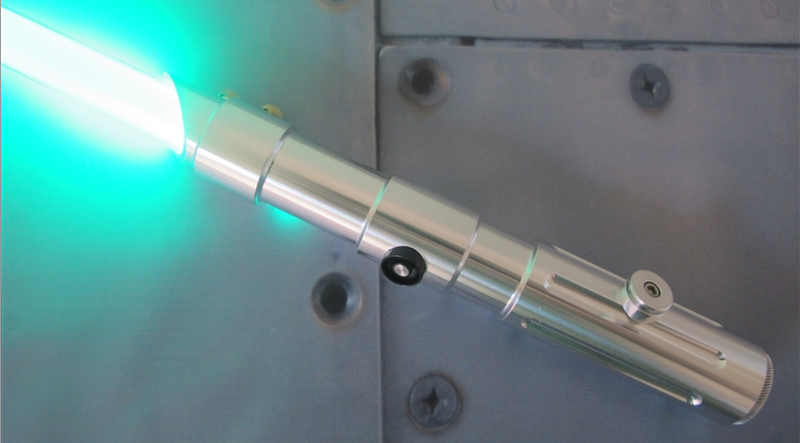 Introducing Ultrasabers, the finest custom lightsaber company out there. With these sabers, you can duel to whatever intensity your heart desires. The site has everything, from double-bladed sabers, to crackling crossguards. While the price may seem a little much, you’ll be absolutely amazed by what you receive. For my first saber, I chose the Prophecy v3, which is based on the hilt that Anakin Skywalker used in Episode II: Attack of the Clones. This saber was eventually lost during the Battle of Geonosis. I ordered it with Obsidian LITE soundboard, an Ultraedge Heavy Grade blade, and, for the color, Guardian Blue. When I first got it, some factors that surprised me were its weight, color, and volume. Let me tell you right now, if you think holding a fishing rod one-handed is too heavy, you’ll have one heck of a struggle keeping these sabers suspended in your hand. When I first picked it up, I had to use two hands, but as I practiced with it, it got lighter and lighter. Another thing was the color. On camera, the blade appears white with a blue hue around it. The blade is actually a pure blue color. I definitely recommend the Ultraedge blade, as they allow the light to cover the whole blade, giving it a full look. Finally, the sound. Obsidian LITE is all you need, it sounds great, had motion and contact recognition, and is the best soundboard for its price. Thank you for reading, if you end up buying one, I hope you enjoy it as much as I do.